Ruined clothing is a bummer! You spend tons of money on an article of clothing, only to find that it eventually becomes stained or too small! 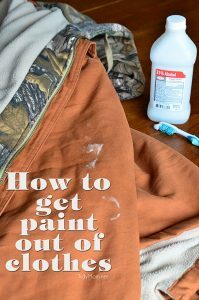 Instead of living with your ruined clothing, or just throwing it away, fix your ruined clothing with these tips and tricks. #1 Learn how to patch a hole in your favorite sweater with a favorite embroidery patch and some spray adhesive. Use this tutorial! 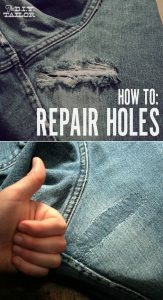 #2 Repair holes in your jeans with this easy tutorial! You can fix ANY hole in any area of your jeans with this easy DIY sewing hack. All you have to do is patch it up and sew! #3 If you accidentally washed (and dried!) a shirt with an oil stain or two, you can still salvage your shirt! Remove with a mixture of baking soda, WD-40, and Dawn dish soap. Tutorial here. 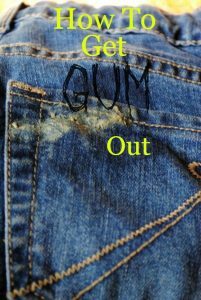 #4 It seems like kids and gum stains go hand in hand. I don’t even know how these stains HAPPEN sometimes! Remove gum stains with only vinegar using this amazing tutorial. 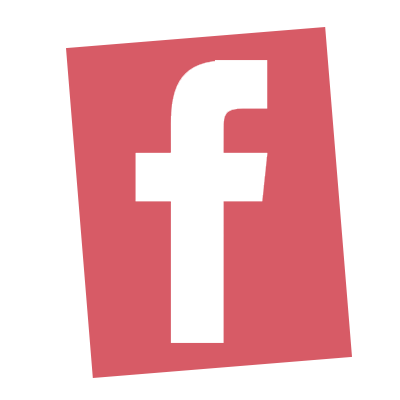 #5 Wrinkles can make you look dishevled and unprofessional. But who really likes to iron? Remove wrinkles from your clothes with a DIY wrinkle release spray from One Good Thing. Just use vinegar and hair conditioner! #6 If you love to paint, you probably are no stranger to a piece (or two) of stained clothing. Use rubbing alcohol and a handy dandy tooth brush to easily remove stains! 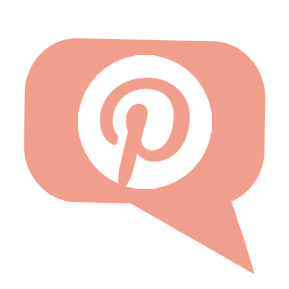 Tutorial at Tidy Mom. #7 Hairspray is pretty much a god send. Use it to remove set in ink stains from clothing. If you don’t have hair spray on hand, try using hand sanitizer! The alcohol in both of these products easily break down the ink pigments. More at OGT. #8 Broken zippers are the bane of my existence. I can’t even begin to tell you how many pairs of paints or jackets that I’ve tossed due to this! 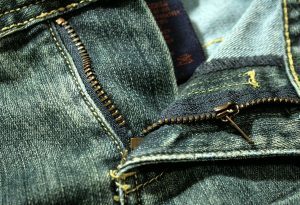 Repair a broken zipper a slider OR a screwdriver! Either will do the trick. More at The DIY Taylor. #9 Say adios to yellowed armpits! A paste made from dish soap and hydrogen peroxide, even the yellowest pit stains are unmatched! Another great tip from One Good Thing by Jillee. 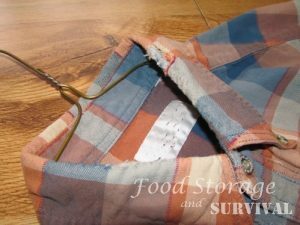 #10 You can easily repair a fraying collar with a quick tutorial from Food Storage and Survival.